1. 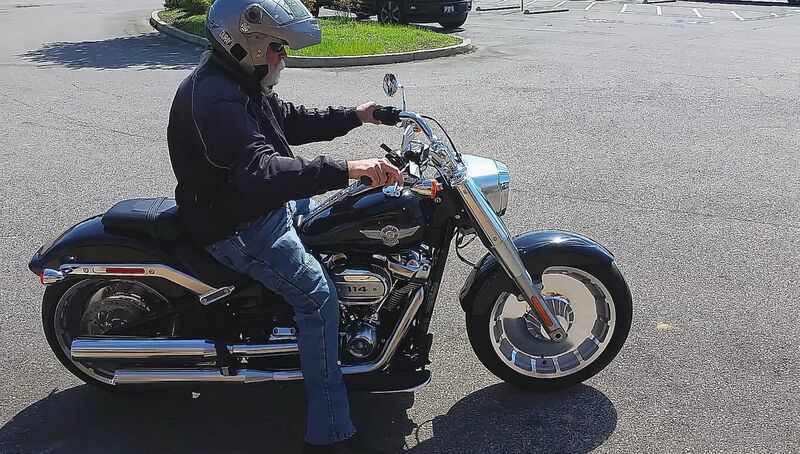 The bike feels light...not as light as a Sportster, but substantially lighter than a pre-2018 Softail. 2. There is no ignition switch. There is a FOB, and the minute you push the Run switch on the controls, it is on. 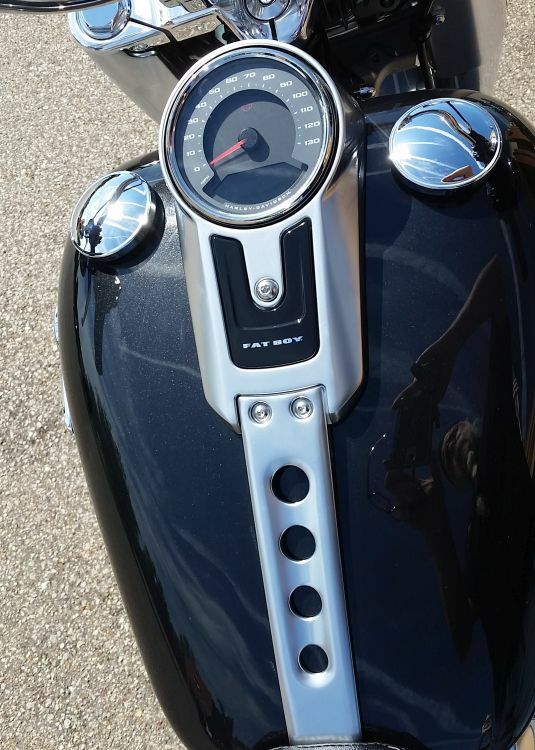 The 114 Cubic Inch M8 Engine is smooth and quiet. 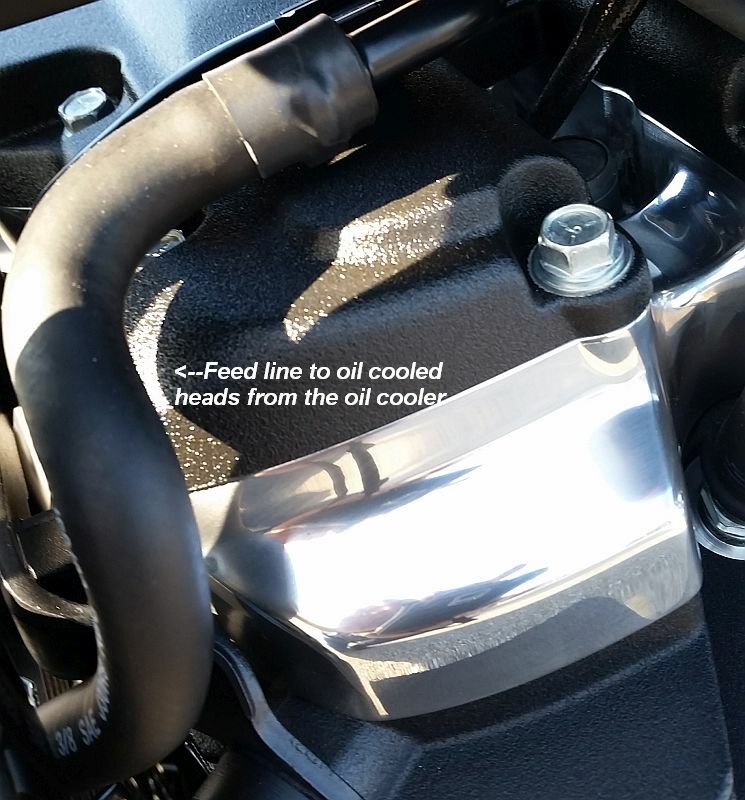 With gear driven counter-balancers, it is smoother than the Twin-Cam B engine. It also has serious low end torque, and seems to keep pulling past where the 2017 M8's flattened out. I was up to 90 MPH, probably in the time that my 103 Twin Cam might have gotten me up to 60 MPH...and it all happened very smoothly, without me even realizing it. What is this? 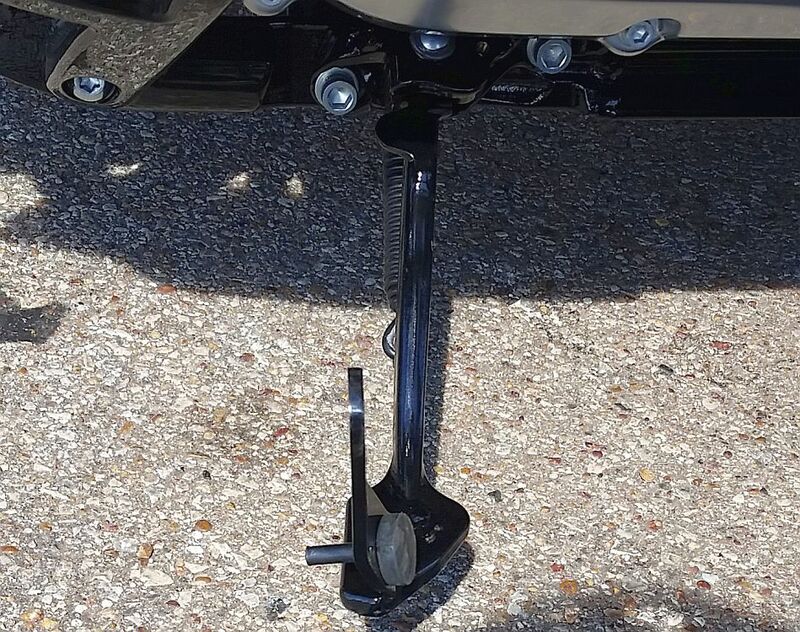 Some folks may like it, but I was surprised to see the tried & true "locking" Jiffy Stand replaced by a this kickstand. There is not a lot of plastic on the bike...but there is some. And two different pieces need to be removed to get to the transmission filler & dipstick. I will need to ride this new frame some more, but my first impression is that the monoshock suspension delivers a superior ride quality, and that the frame is much improved. I did not experience any wallow while hitting the curves at speed. 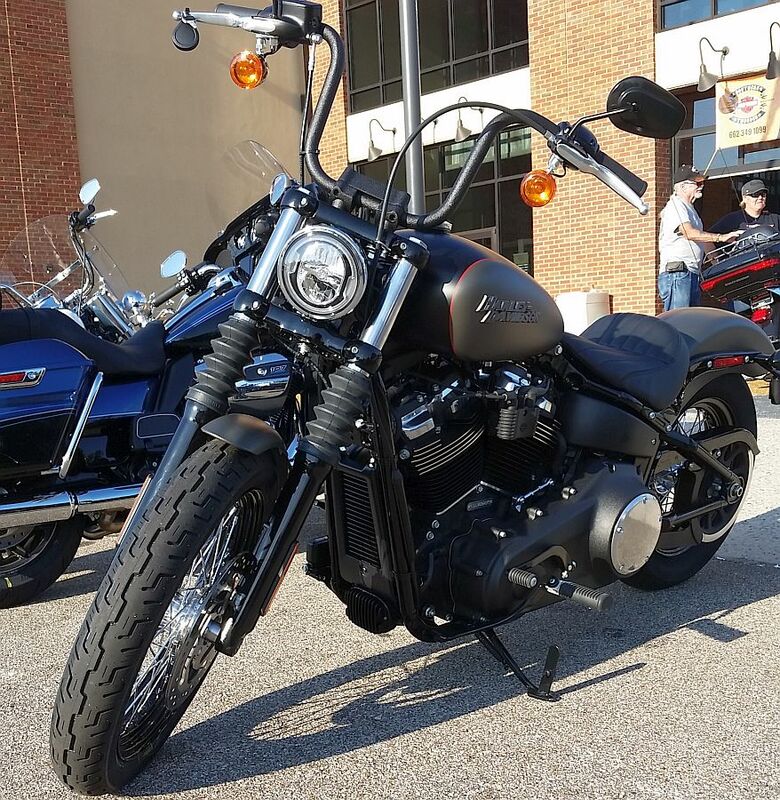 After I had finished my two hours with the Fat Boy, the Dealership had just finished of their PDI on a Heritage. I spent some time looking it over, and could have ridden it, but I was so flummoxed by what I saw...not only did I not ride it, I completely forgot to take photos of it. It looks like the photo's on the HD site. 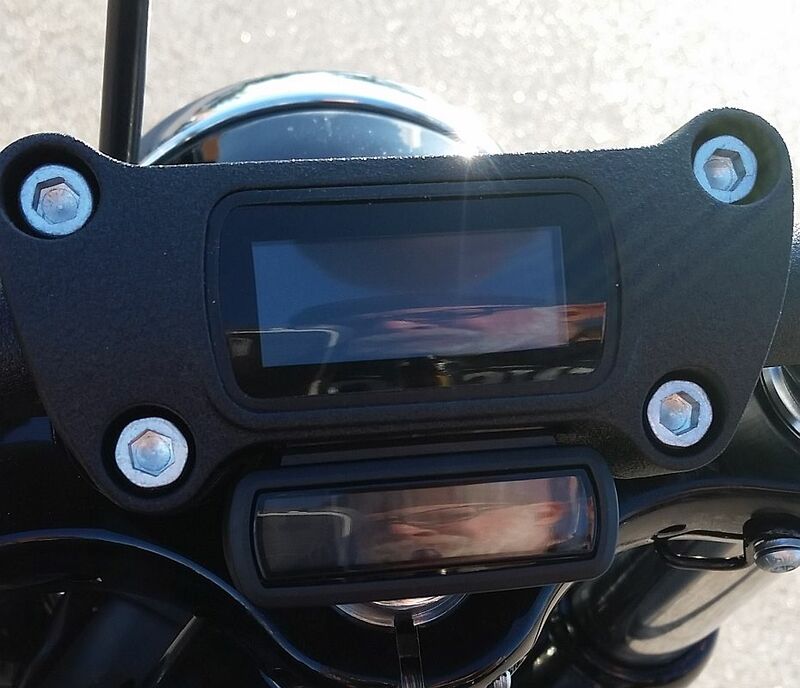 It has the same frame as the Fat Boy, with the same interesting changes outlined above in the photos and video. 1. 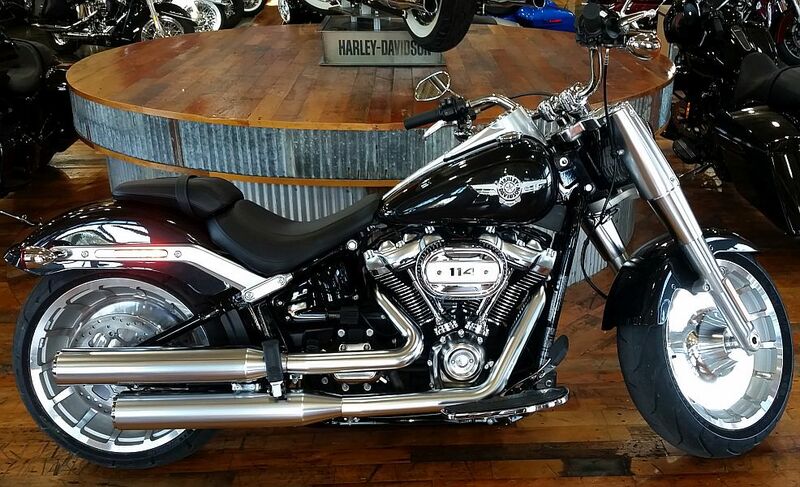 If you don't like the chrome studs on the seat and the saddlebags from previous years, it is doubtful you will like the black protrusions that have taken their place. If you do like the chrome studs on previous years, it is doubtful you will like the black protrusions that have taken their place. 2. 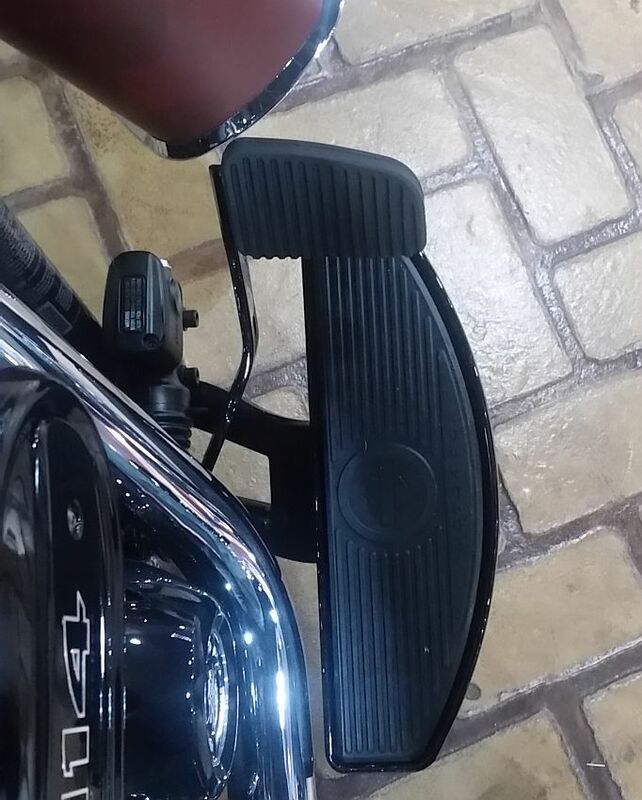 The saddlebag lids are amazingly flimsy, surprisingly lacking in rigidity. 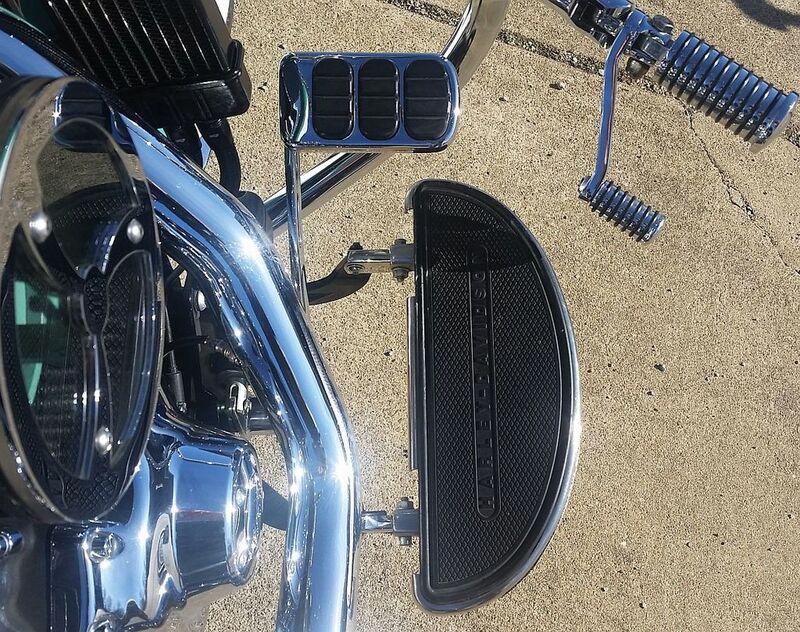 The button to open/lock the saddlebag is up top, in a recessed plastic "cup". Whether it is rain, or just washing the bike, it will make for a little pond. It is all plastic, so it won't rust...but I am not sure it will not leak into the bag. 3. The floorboards are narrow. Again, I did not take photos, nor measure them, but they are at least 1" LESS wide than the standard floorboard width found on FLH models. 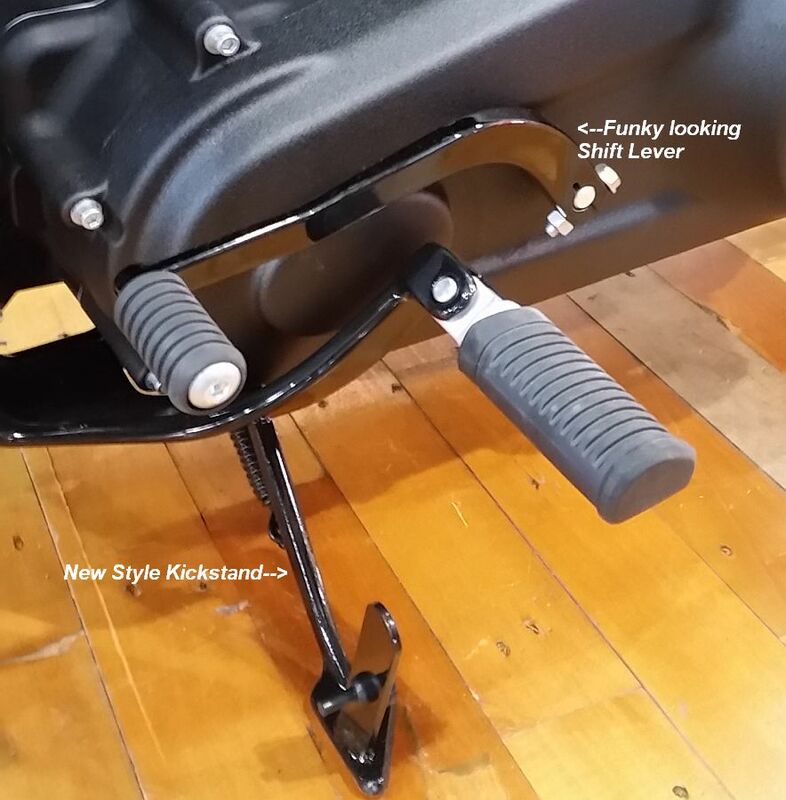 As noted in the video, on this new frame the floorboards sit higher off the ground/closer to the seat level, and with them being more narrow they may be comfortable for a smaller rider, but even at 5' 11", I felt very cramped. 4. 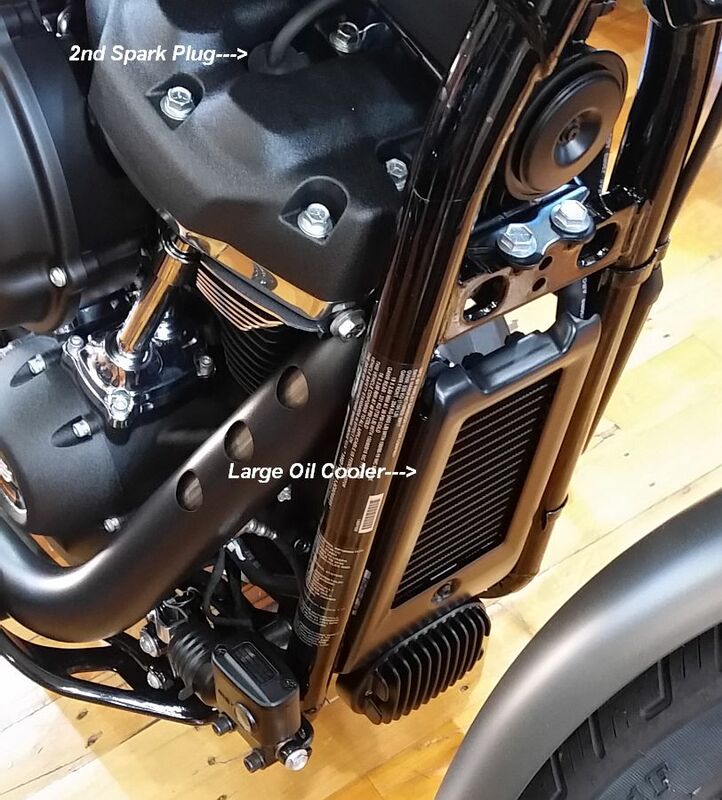 The Heritage has 4.4" of rear travel (as does the Fat Bob), the rest of the Softail line has 3.4" of rear travel. Like the Fat Boy, and previous years of the Heritage, it still has a 5 gallon tank. 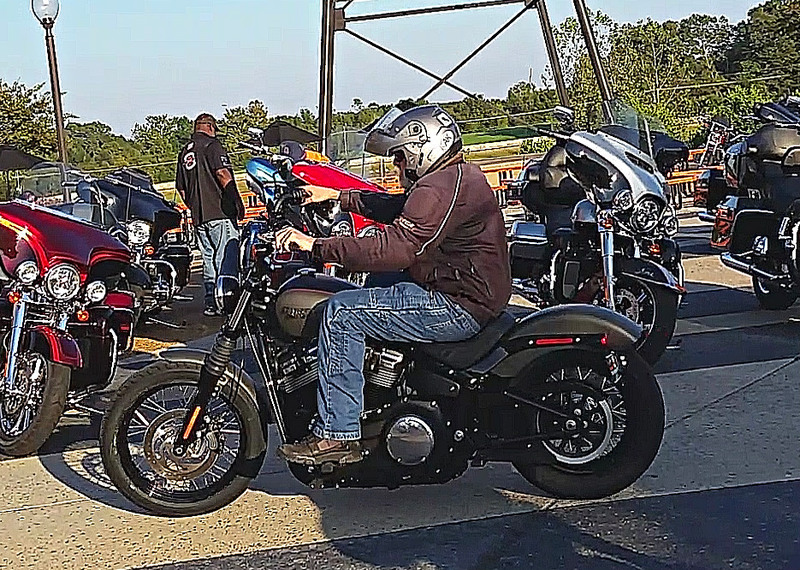 It feels much lighter pulling it off the kickstand, and like the Fat Boy, it no doubt accelerates quickly and smoothly. 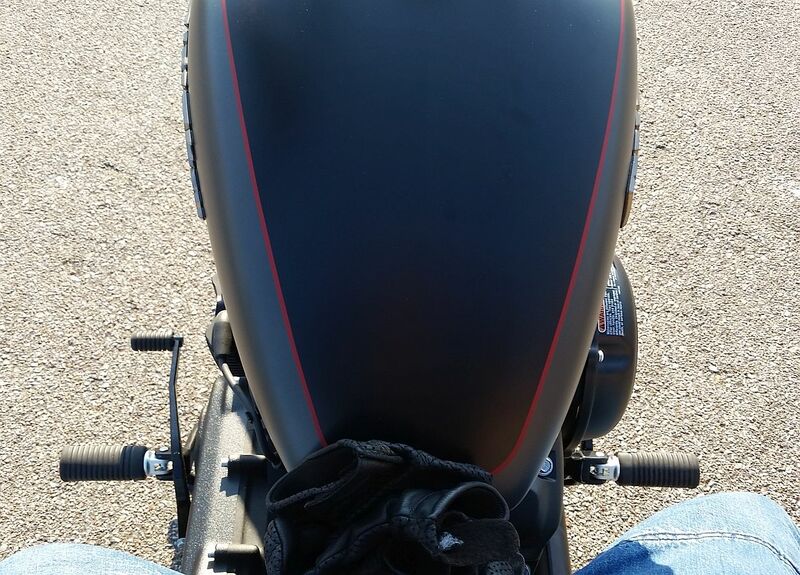 Unlike the Fat Boy, the seat needs to be removed to adjust the monoshock pre-load. 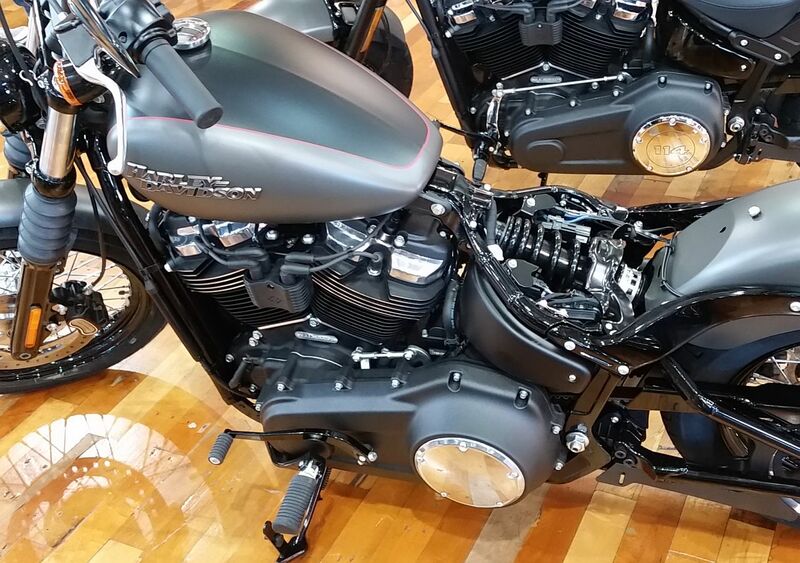 On all the new Softails, Harley finally made them with a "Tank Lift" and a Relocated Coil...from the factory. 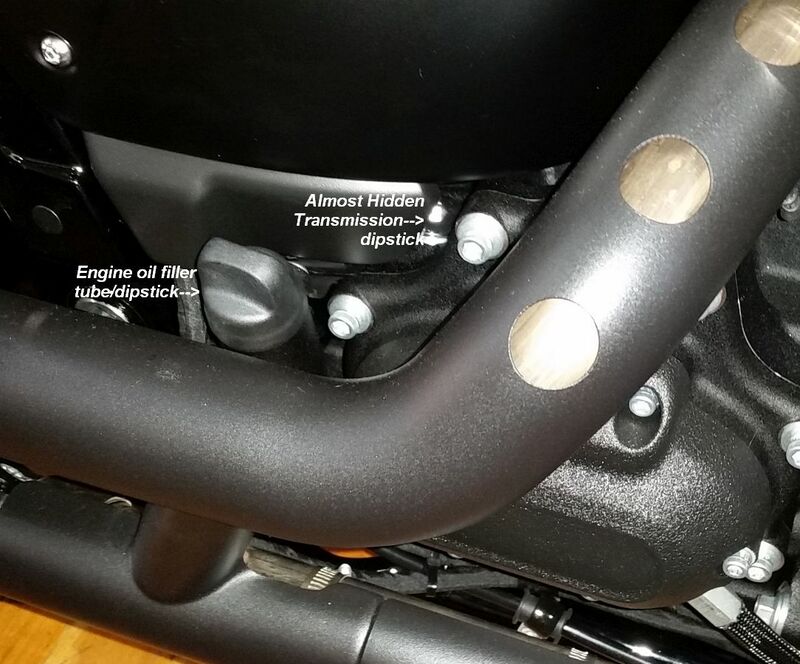 Guess they finally learned that these changes reduce engine temps and rider buffeting. A first look at both sides. It is powered by a solid mounted Milwaukee-Eight 107 CI with gear driven counter-balancers. 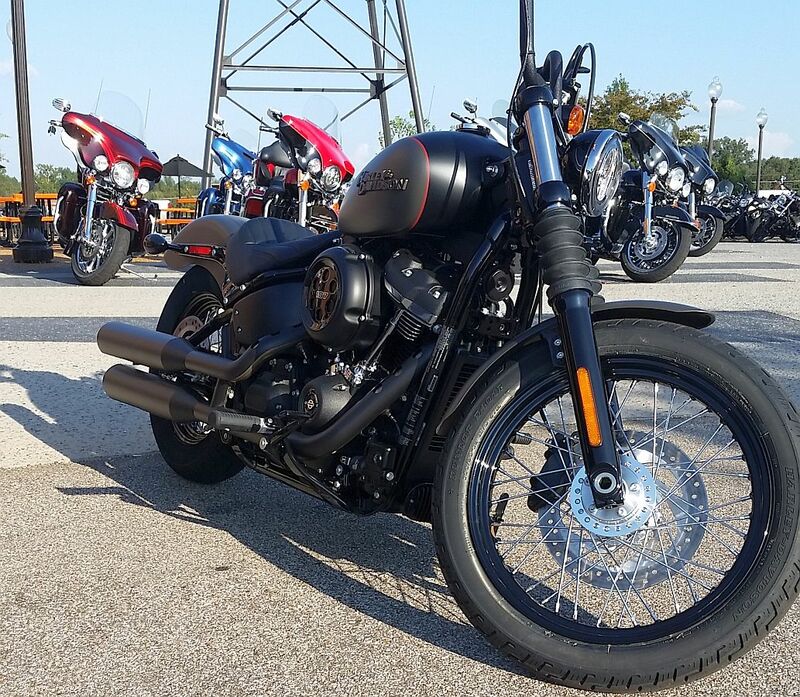 First off, the Street Bob is Not a Dyna anymore, it is the new mono-shock Softail. 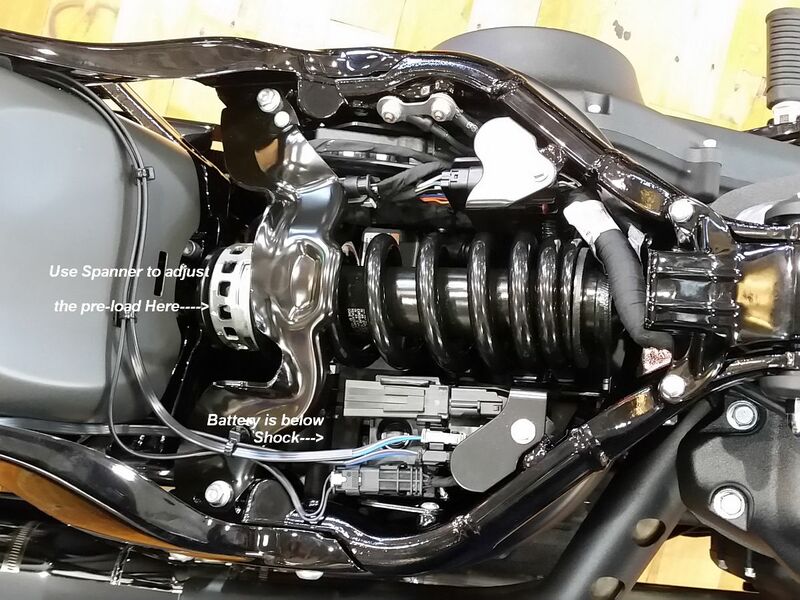 The pre-load on the shock is adjusted with a spanner wrench, under the seat. 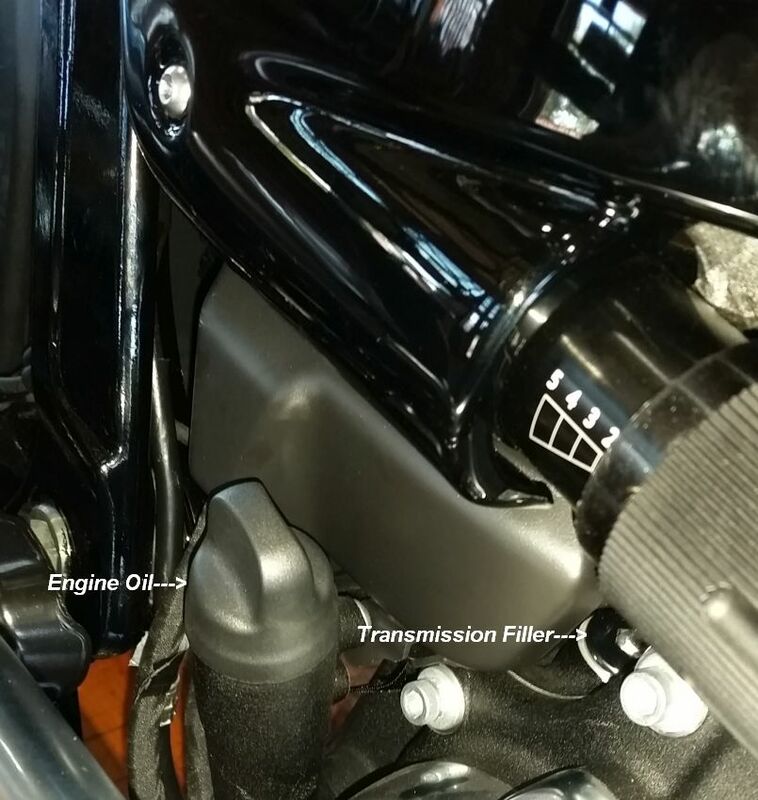 ...you can also, almost see the transmission filler hole/dipstick. Two panels need to be removed to gain access to it. ...and this line takes the oil from the heads, dumping it into the oil tank sitting below the trans. 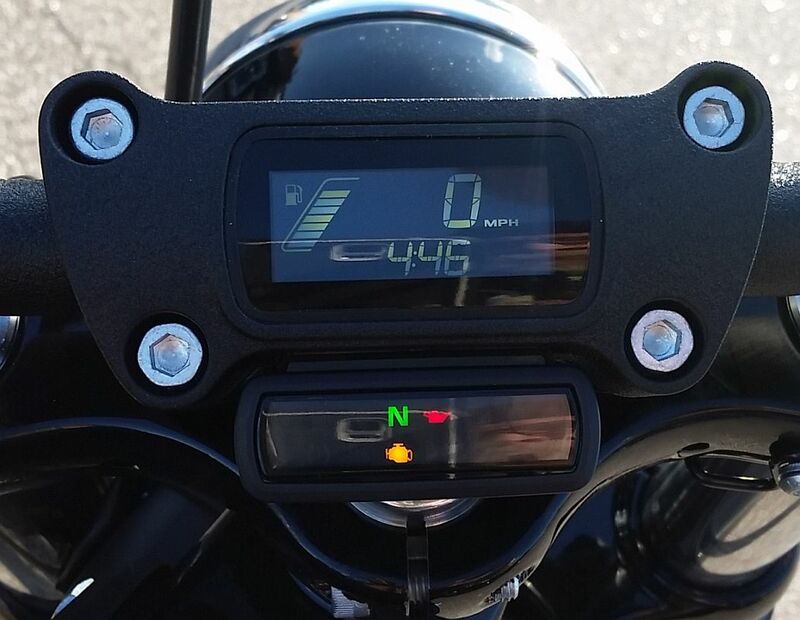 Couple of photos of the compact gauge cluster on the Street Bob. It was easy to read at all times for me while riding. I do not know what I did not like about this gear shift lever. It functioned fine, but it looks odd to me. 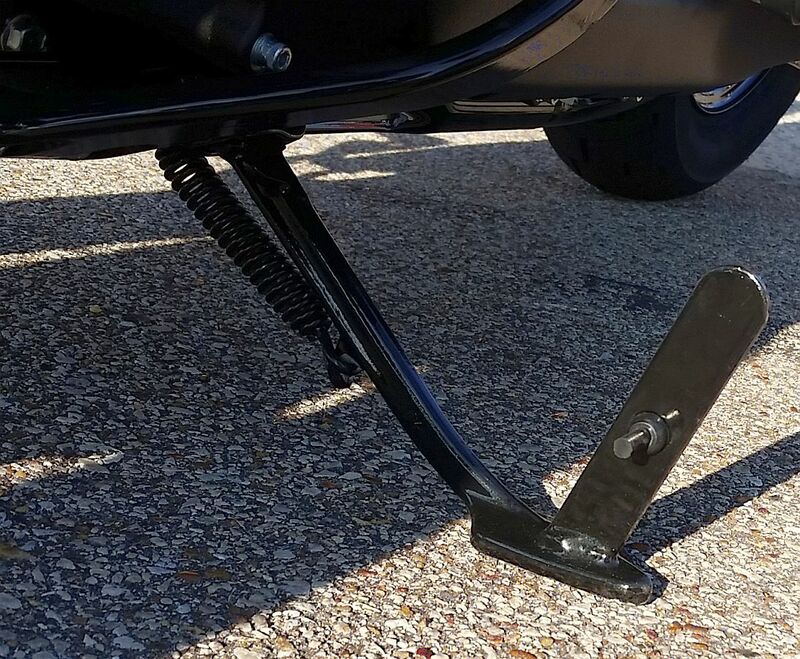 A close up of the new locking kickstand that is found on all the 2018 Softails. The footpegs are completely different than previous years. 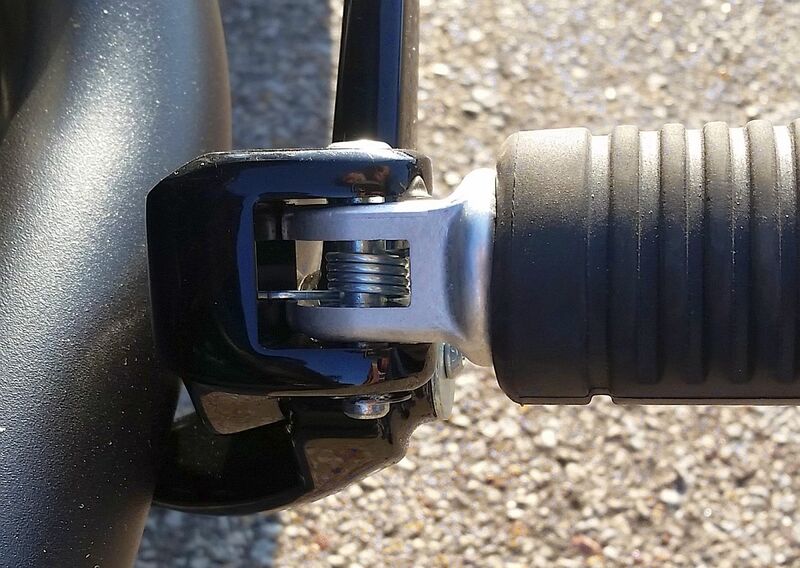 The riders' pegs are spring loaded, and work much better at staying down than previous year pegs that utilize a spring washer. However, you cannot fold them up and have them stay folded up. 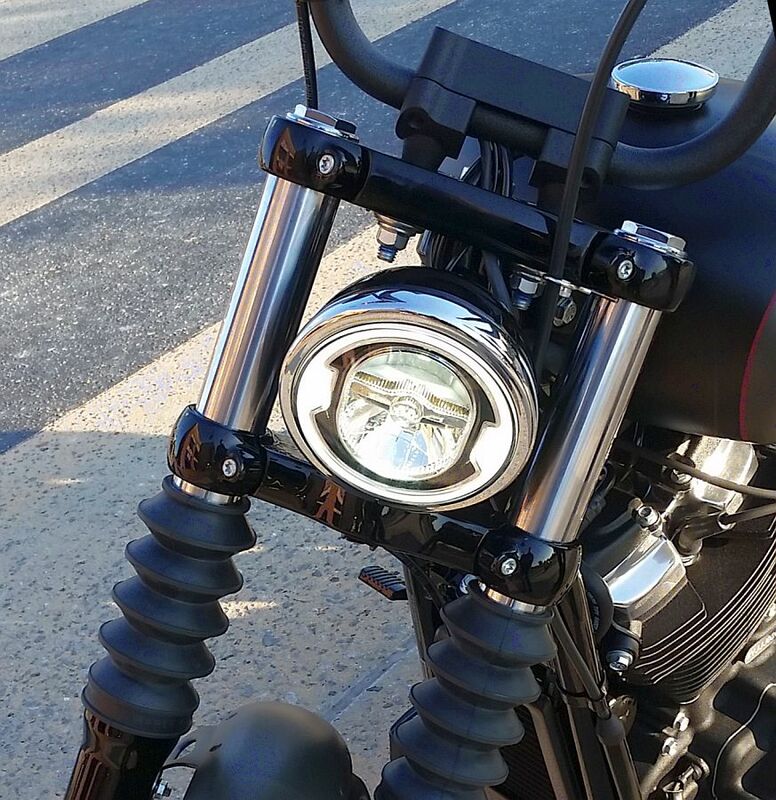 I did not ride at night, so can't say how well the LED headlight lights up the road, but it looks good during the day. As good as the light looks, I cannot figure out any good reason for the risers fasteners to be so un-finished looking with the stud, washers and nuts. What was wrong with using a bolt, and only having the bolt head showing? The bike feels VERY light pulling it off the kickstand. Close to what my Sporty feels like. Then I put my feet on the pegs for the first time. I'm a bit under 5'11" and I felt very folded up. My knees felt quite a bit higher than my hips. I did not like it at all...others may really like it, not me. Ignoring that...the rear suspension was fantastic. It ate up all the bumps, large and small. It was tight, no wallowing at all in the curves. 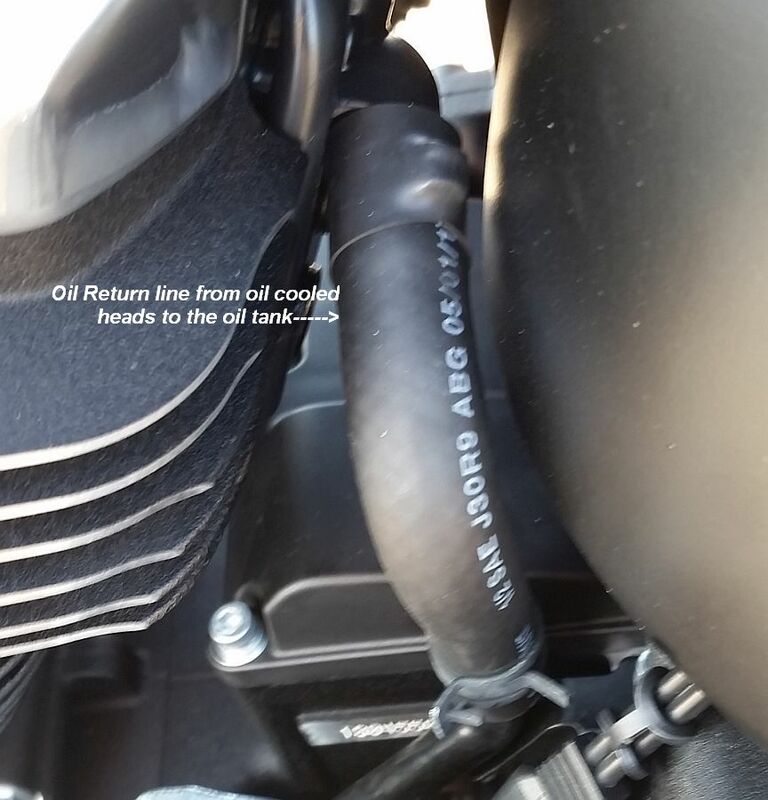 The front suspension was typical HD, and needs some help. The little time I spent riding it, there were no surprises, it did everything I asked it to. I did not come close to scraping the pegs. Power was good, acceleration was smooth and fast (for a HD). Cruising at 70 mph in 6th, and then getting on the throttle had me at 85 mph very quickly. There was no low speed hesitation, just a strong pull going thru the gears. I would need to re position the pegs, but after that I would enjoy riding this bike.